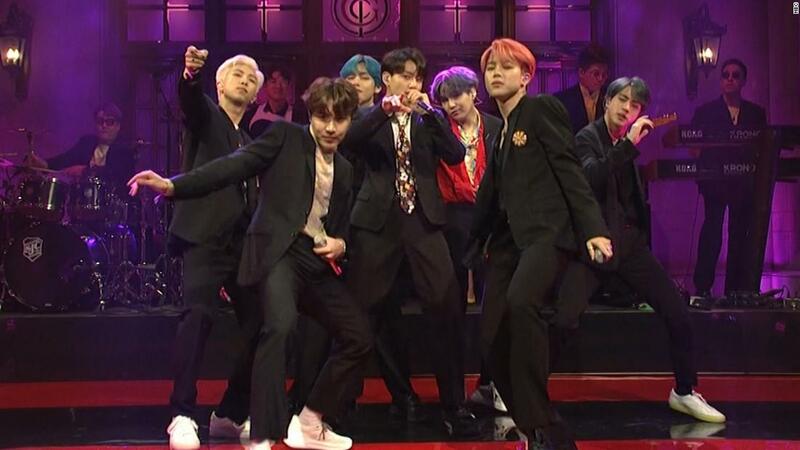 Sure, "Saturday Night Live" was hosted by Emma Stone and took jabs at Michael Avenatti, Lori Loughlin, Julian Assange and "The View" – but the spotlight was on the seven members of the boy's sensation  BTS became the first Korean pop, or K-pop, to perform on SNL. Korean pop music has been steadily growing in popularity. But the BTS has raised the genre into an international movement. "My daughter is making a really weird mouth-nose watching #BTSxSNL and just had to take her hoodie off because she's sweating." It's a #BTSARMY thing for those not aware, "said radio host JJ Ryan. "Slay !!! Their voices were perfect … They adjusted their dancing to that tiny stage and they were backed up by what looked like a Korean band. cake down for this performance, "said Jae-Ha Kim, a journalist for the Los Angeles Times. "Live band, Killer vocals, Moves for days, Crushed it, that's how you say 'what's up America?' # BTSxSNL '' said writer Colleen Nika. "I screamed in my living room." The band's performance also sparked a conversation about the historical and cultural impact. "I've been watching SNL since the late '70s till I stopped watching in the 90s Never seen an Asian face on their staff always stung But tonight I just saw 7 Korean faces gracing that damn stage and it was the best part of that show so I AM OVER IT #BTSxSNL, "said actor Paul Bae.